My answer is always to choose what you know and love yourself. If you love classical, start there. If the Beatles get you going, start there. If it’s music with a heavy dance beat, by all means, listen to it with your students. Your enthusiasm in the music you choose is critical to the success of the experience and even if you think your students won’t enjoy the music at first, giving it a try and sticking with it will prove to be how you can get your students on board. Introduce the music by sharing a personal story about why you love it. Maybe it marked an important time in your life, or maybe it gets you moving and pumped up when you need a jolt of energy. Share the music with your students and then ask them to share their music with you. It doesn’t mean you have to play their music during your class time, but just the invitation alone starts to build a nice bond between student and teacher. I remember when I opened up that door with my middle school students, I had many mix CDs loving made for me. I’d listen on my own time and have great discussions with students about their music. I even made a few new song favorites along the way! Some teachers, however want to do even more with music in their classrooms. Their goal is to work it seamlessly into their day to use for transitions, to energize their students or to help them focus on a task. For these needs I refer you to an expert in this field, Chris Brewer, founder of LifeSounds. She has worked with educators in the realm of music integration as well as brain-based teaching methodologies and music in health services. Her book, Soundtracks for Learning is an absolute complete resource for the multitude of ways music can aid teachers in helping their students learn. 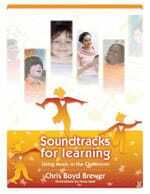 Soundtracks for Learning – Using Music in the Classroom, provides teachers with the techniques to bring music into their classroom in the most effective ways. Furthermore, it explains WHY music is so effective in helping our students to learn. So many topics are covered from setting the right attitude and atmosphere to memory association through music, adding soundtracks to your teacher presentations and reviews of facts and vocabulary to good old classroom management. It will amaze you what you can do with music in the classroom and how you can use music to increase learning! As a busy teacher your main concern may be how you can use this 286 page book effectively. Chris does a great job of including a detailed table of contents so that you can flip to parts of most interest easily. She provides a lot of information about why these ideas work, which is great for the advocacy of integrating music into what you do. But the best part is that she provides activities for each section. So, if you are interested in using some music to aid in the memorization of content, go to that chapter and Chris has about a half dozen activity ideas accompanied by listening suggestions. Yes! This is what teachers really, really want to know: Does she give song suggestions? And the answer is YES! Chris has provided a thorough appendix which includes song titles and song styles as well as how to choose music for a variety of moods and needs (energizing, welcoming, etc) according to bpm (beats per minute). The window for commenting is open NOW and will end on Thursday, 3/28/13 at 11:59 pm. The winner will be announced on Friday morning. Good luck and happy commenting!